Summer is here and it’s time to have some fun in the sun! Lumen is a video and performance art festival on Staten Island’s waterfront. 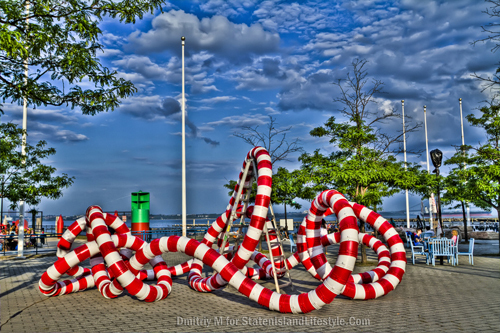 Last year LUMEN festival brought thousands to the Staten Island waterfront for an evening full of exciting performance art and video installations. In its third year, the festival promises to be even bigger. For the map, directions and what to expect from the festival please refer to this helpful article What To Expect If You’re Coming To LUMEN. Tickets: Free of charge and open to the public. Raja and her troupe will perform “Passport to India,” a representation of traditional Indian dance. The dances will include Bharatha Natyam, a classical style of dance that originated in the ancient temples and has survived over 3000 years, recent Folk dance, and Semi-classical dances that borrow from both the classical and folk disciplines. The performance will include traditional costumes, jewelry, and music from India. The audience will be taught several hand gestures throughout the performance, and will be given colorful “Bhindis”. Julius Caesar by William Shakespeare, a classic tale of intrigue and murder re-interpreted with a female cast. Directed by Ritty Mahoney. Hiking is the ultimate way to enjoy the outdoors and reduce stress. The Urban Park Ranger hiking guides will introduce you to the hidden gems of New York City and places often off limits to the general public. This particular hike is of a vigorous intensity level. It is long distanced, with hills and rugged terrain. Some species of ladybugs, including the official insect of New York State seem to be vanishing. Learn how to identify ladybugs and become part of a citizen science program to help Cornell University scientists track ladybugs. Bring your digital camera. Suitable for children age 7 and up. Registration required. Here’s a great way to cool off after a heat wave – Kayak Staten Island – is an organization providing free kayaking for the public. They provide the use of sit-on-top kayaks, life-jackets and paddles. Offering paddling tips and launch/land assistance. Experienced kayakers are in the water for further assistance. Where: located on South Beach at the end of the Boardwalk in Parking Lot #1. The Committee to Save Pouch Camp invites you, your family and friends for a celebration of open space and preservation of the William H. Pouch Scout Camp. Pick-up the Committee’s full color brochure at the event and find out how you can help preserve Pouch Camp for future generations. Guided tours by naturalists of the lake area every half hour starting at 2:30 pm. Learn more about the preservation effort. Do you ever wonder what the animals do all day long at the zoo? Come to the Staten Island Zoo and watch your favorite animal get their favorite toy. You will be able to see these magnificent animals use there natural instincts and curiosities. Special animal encounters, keeper talks, and crafts for the children. Visit beautiful homes and gardens along the tree lined streets of New Brighton – east of Snug Harbor Cultural center. The tour includes four to six historic houses in the Hamilton Park section of New Brighton, a suburban community designed around 1860 by Charles K. Hamilton. For more information please call (718) 448-2006. Wishing everyone a happy weekend full of fun and smiles!